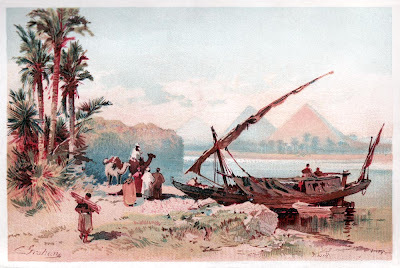 Here's the color frontispiece (a Chromolithograph) from Thomas W. Knox' The Boy Travellers in the Far East / Part Fourth / Adventures of Two Youths in a Journey to Egypt and the Holy Land (Harper & Brothers, New York, 1883). There are plenty of other interesting pictures in this book, but this is the only one in color. Again a digital camera photograph of a picture in a magazine, processed in Photoshop. 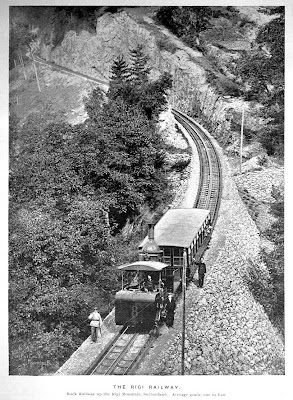 The Rigi Railroad, from the September 1894 issue of INLAND PRINTER and carried there as an advertisement for a half-tone photo-engraving company. I've been collecting interesting historical images, and put some of them on the web on a few specific-interest sites I host. This is a blog for general-interest topics. 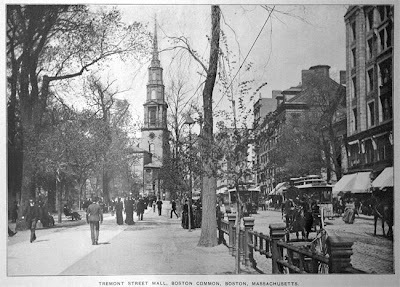 Here's an experiment: Boston, Tremont Street, 1890's. From a photograph I took of a half-tone engraving in the February, 1895, issue of INLAND PRINTER.